Hi, Legions of the Unspoken! You can call me Morbius95 (aka Lee). That’s all you get for now! As you will probably be able to tell, this is my first time writing on a professional level. I decided I wanted to write because I have a voice that can possibly help someone through my writing. (Plus it’s fun!) I was born in the 90’s, so I guess that makes me a perfect fit to write about this unspoken decade! My first tastes of comics came in 2003 when I acquired The Demon #22 for my 8th birthday from a cousin of mine. I have been in love with comics ever since, with a special fondness for the 90’s despite not collecting till the 2000’s. Doom Patrol became one of my all-time favorite groups when I first acquired, you guessed it, Doom Patrol #70. I became infatuated with these outcasts because I felt like one my self. Kate Godwin (aka Coagula) made her debut in that issue of Doom Patrol, published in September of 1993, and quickly made an impression as one of the first ever transgender characters in DC comics history. 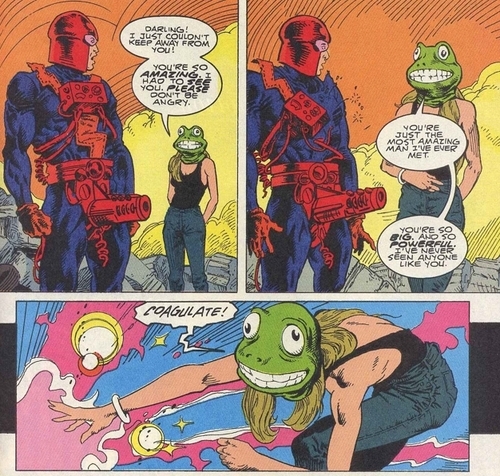 Created and written by the amazing Rachel Pollack and penciled by Scot Eaton, Coagula’s appearance stood out in a landscape where LGBT issues in comics had been limited to very few events, such as Marvel’s Northstar coming out in Alpha Flight #106 (1992) and DC’s Pied Piper coming out in The Flash #53 (1991). Appearances from transgender characters were practically nonexistent in the Big Two –that was until Coagula showed up. Really ahead of the whole steampunk trend. We first meet our super-heroine picking out a mask for her friend Jean’s birthday party, a fairly realistic looking frog mask. They leave the scene and head to a bar, where we learn about her powers, which are she can coagulate liquids and dissolve solids. We find out that while working as a prostitute she gained her powers from sexual contact with Rebis, a radioactive hermaphrodite formed by the original Negative Man Larry Trainor and Dr. Elanor Poole, who are forced to merge by and with the Negative Spirit that had left and then returned to Trainor. Why you get the money up front. Next we find Kate in a bar showing off her powers for her friend. She also discusses trying out for the Justice League, who liked her powers but didn’t like the way she was. At first we think she’s about to give up, but boy are we wrong. 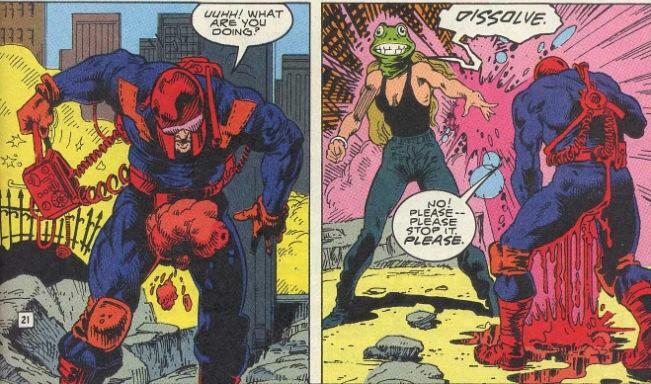 Codpiece is seen walking up to a bank, which he proceeds to blow away part of with his, well, codpiece. He then drills a hole in to one of the vaults with the piece, which is basically like a Swiss Army knife with all its attachments. The police try to stop him, but that goes as well as you would expect, and Codpiece knocks one out with a boxing glove from, well, you know where by now. And he wonders why he doesn’t have more luck with the ladies. I haven’t said much on who else is in this story mostly because I wanted you guys to know how great Coagula is, but yes, there are others in this story as well. Like the couple that come to help the cops take on big old Coddy, George and Marion of the Doom Patrol! Earlier in the story they decide to get out of DP HQ and go out on the town to have some fun. They invite Cliff (aka Robot Man), but he refuses. (We’ll discuss that at a later date.) They encounter Coddy as he unleashes bombs from his piece and conks two officers out cold with some technical prowess. They throw everything they can at him but to absolutely no avail. He stops them at every corner, and when all seems dark for our heroes someone takes notice of the scene, and that someone is…Coagula! Kate had an official costume at one point but got rid of it because she didn’t think heroing was her calling. Then she remembers the green frog mask from earlier and puts it on. When the lady in the frog mask is the most normal looking person around, you know things have taken a turn. Immediately you can tell he is distracted by this seemingly normal woman who’s just wearing some costume mask, but boy is he in for a huge surprise, folks. Pictured: every man’s worst nightmare. After is all said and done, George and Marion are very impressed with the abilities Coagula showed off, so much so that they offer her a spot on the Doom Patrol. She accepts their offer to go with them, thus turning into one of my personal favorites of the Doom Patrol. This was ground breaking for the time to see a transsexual lesbian in a comic. (She later turns out to be bisexual, dating Cliff Steele.) When I first read it, it honestly blew my mind, especially for the decade it came from. I just wanted to thank Dean for giving me this opportunity to write something I’m very passionate about and hope to write more in the future. The reason I’m passionate about LGBT issues is because I myself am bisexual and genuinely care for my community. I had problems as a child thinking something was wrong with me, and these comics helped me through some tough stuff in my life. Thanks for letting this manic depressive have a shot where most wouldn’t give me one.